Point of care (POC) technologies are rapidly becoming part of the revolution of the healthcare landscape. With evolving high–tech innovations in healthcare, including smartphone apps, biosensors, lab–on–a chip, and wearable devices—all of which offer a closer connection to the patient. The dynamic of point of–care testing (POCT) is to bring testing closer to the patient and results conveniently and quickly to the provider to expedite diagnosis and subsequent treatment. POCT allows for faster clinical decisions in hospitals, physicians’ offices, ambulances, patient homes, and in the field. This report titled “Point of Care Testing – Global Analysis & Market Forecasts” provides a comprehensive analysis of the emerging point of care tests market segments, including their dynamics, size, growth, regulatory requirements, technological trends, competitive landscape, and emerging opportunities for instrument and consumable suppliers. This report also provides market landscape and market share information in the point of care testing market. The report brings together major merger & acquisition, distribution agreement, licensing deals and collaboration deals information in point of care testing market. The report also entails major drivers and challenges of point of care testing market. 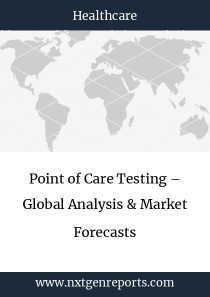 The following 13 segments of the point of care testing market are detailed with market size and six year forecast.